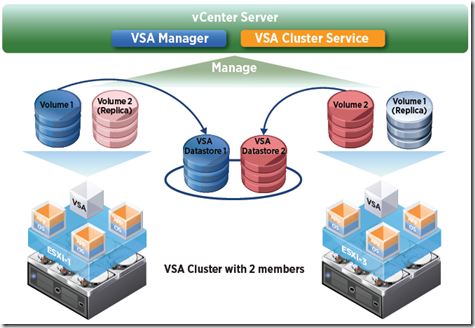 Or – How can I do shared storage at low cost for my VMware Virtualisation setup!! SAN’s and NAS boxes are often hoist upon smaller IT shops, as part of a ‘virtualisation’ solution. The price of SANs continues to plummet, and in most cases, they are reliable enough, simple enough and certainly low cost enough to be an obvious choice. But in many cases, organisations have invested in great quality Dell, IBM and HP Servers, that are full of high speed disk, with State of the Art RAID Controllers (Dell Perc, HP Smart Array, IBM ServeRAID), offering adequate cache and IOP acceleration. These are the Servers that will run VMware ESXi – But these servers can also run a Product from VMware (VMware VSA), that will tie all of the storage locked away in each Server, into a unified shared storage array. As we know – great functionality such as Vmotion requires shared storage. If any ESX Server were to fail, the Storage, being Synchronously mirrored to another ESX Server, ‘kicks’ in. 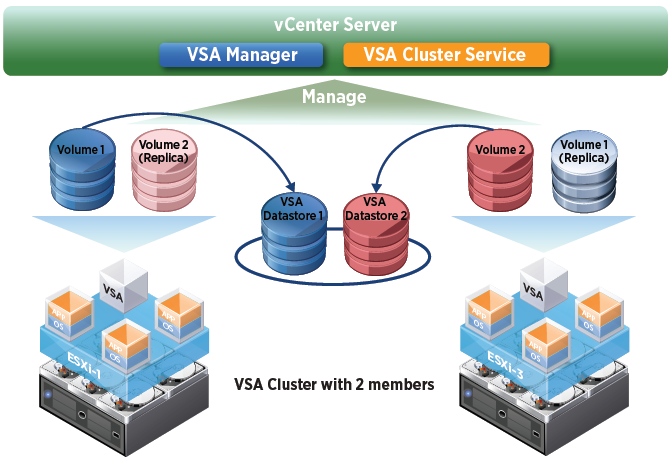 If I have further ESX Servers that need/require shared storage, then these Servers can access the 2-Node or 3-Node VSA cluster and take advantage of the NFS share presented – These further servers are not required to run VMware VSA though. and – its just sheer simplicity and good economical sense to utilise all of the storage you have locked away in your Dell, HP and other servers – which is usually a good sight less expensive than the purchase of an outboard SAN.